I’ve been asked a couple times if I was going to continue my plant editing, so here is the next plant item I’ve been working on. This poor little hedge was in some desperate need of some tlc. 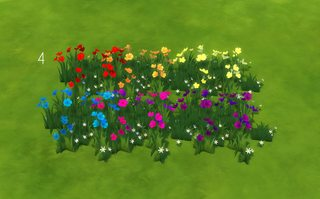 I have made a separate mesh for each flower type that was on the base hedge, and provided 4 flower color options along with 4 leaf season colors, for each mesh. 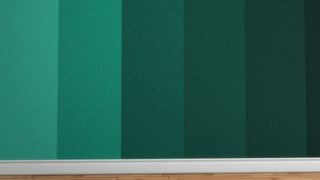 So in total you get 4 hedge meshes with 48 color swatches, and as a bonus I’ve included the hedge with no flowers at all that sports it’s own 5 color swatches. Minor note: The 5th color on the hedge with no flowers is unique to that hedge alone as it did not make sense to have a “dead” hedge with flowers! Special Notes: Repeat placement has been enabled for all of these hedges! I created this mod mostly for myself but after thinking it over I thought some other people might enjoy this as well. This mod adds a new plasma pack that you can purchase through a new pie menu under vampire secrets. These new “advanced” plasma packs replenish thirst x2 of the base plasma packs, and cost x2 more. Note: These DO NOT override the base plasma packs. And DO NOT touch anything to do with created plasma packs with fish/frogs. To access these new “advanced” plasma packs, you will require Vampire Lore level of 12 or greater. and have given them all the same frame color swatches, 8 for each image. This way they will better match interiors. I got really tired of my Sims inventory being cluttered with all his mixed tracks, so here we are. This mod is an override of the mixed CDs that are created from the mix music station added with Get Famous. The CDs by default are not able to be put anywhere for storage purposes, so I fixed it. You can now store your CDs in all the storage boxes. As pictured here you can see the Buyer Beware storage chest with the CDs now being stored nicely inside it. Special Note: This is an OVERRIDE. This means any other mods that override these CDs may conflict. Alternate download to MEGA if needed. This cabinet/closet is now a whole lot more useful! I removed all the shoes that where on this mesh, added a bunch of new slots and several recolors. There is now 3 separate meshes to go along with the new swatches. The swatches are separated by trim color so you have 88 swatches for white, 88 swatches for gold and 88 swatches for black. Bringing the total 264 choices in colors. Special Note: The mirror in the back does still show reflections. Mesh Count: 3 Separates \ Merged file of everything is available. The download link is for the merged package of everything. If you want separates please find them below. I created this to pair along with my tuning mod to store mixed CDs in the storage chests. 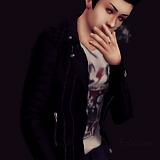 You can find that mod here. This ornate chest has a new mesh that has been sized down to shelf friendly version. No more floor restricted storage chest! 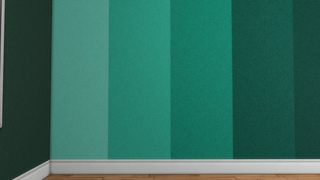 I have supplied the original color swatches from the original version, along with 27 new swatches. Special Note: This chest will act as normal storage. If you want to store your CDs in here you will need to grab my tuning mod for that as mentioned above. This is a 104 swatch stand-alone recolor of the round spot rug for the base game. I always really liked this shelf from jungle adventures, but sporting only 6 slots it didn’t see much use from me. Now that’s about to change. I’ve removed all the clutter objects from the mesh and added a total of 192 slots. The mesh includes all original swatches with 7 additional swatches of my own flavor. I hadn’t exactly planned on moving to this shelf just yet, but while building a set for my story I needed this shelf and it was a disappointment. This little shelf use to only sport 5 small slot sizes that were very awkwardly spaced. Now it boasts 9 medium slots and 27 small slots. Along with the new slot additions, I’ve provided 104 swatch colors. Special Note: Be sure to use moveobjects on when placing items on the shelf. I mean let’s be honest this shelf is amazing, but only 2 slots? This cute shelf is now all cleaned up and fully re-textured with lots more slots! There are now 104 new slots for various deco pieces. This version of the shelf is simply natural woods. I plan to do a version with all the color bands going forward but for now, it sports 9 swatches of pretty wood-like tones. The download link is for the merged collection, separate downloads can be found below. Right so I love this mesh from cats and dogs and decided to create my own version with my fractal artwork I create sometimes. The images are for spring through winter and the simlish font follows along. Special Note: The images were created by me. Let’s talk about the elephant in the room shall we? I adore lava lamps irl! When I saw we got some with Strangerville I was super excited. Alas, the lamps we got disappointed me greatly by lack of color choices and no emotional aura buffs. 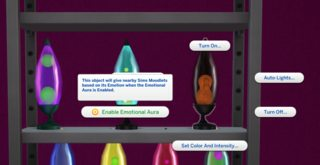 These new lamps each have an aura you can turn off and on at will and 4 options for base colors. The emotional options are: anger, inspiration, focus, flirty, playful, energized, confident. The sneaky rat of them all. The piece I’ve been teasing out over the last few releases are these wallpapers. I absolutely love them to pieces. I couldn’t find walls to match my pallet so I made some. Now, these are wallpapers and not simply paint. The wallpaper has a textured look as if you could run your fingers over it and feel the bumps. This is my favorite type of wallpaper irl and I really wanted to bring that into my game with my own colors so here we are! A dear friend of mine who builds a lot of houses has been asking me for these darn flowers forever lol. So as a thank you to them for always being there for me and testing my content, I went ahead and finished organizing this package to share with everyone. If you enjoy landscaping then you’ll likely enjoy having the additional color choices for these little guys to slot in nicely to fill your spaces in flower beds.